Our Classic Garden Ornament - Windmills. We make concrete windmills for your garden. One of our Windmills has blades and a top that turns and rotates in the wind when placed in any location in your garden. 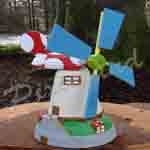 The other Windmill has blades that rotate if placed in your garden with the wind directed towards the blades. These enchanting detailed windmills add a bit of countryside and olden time to your garden. These are our traditional range that has been made by hand, for over 70yrs at Pixieland. A perfect addition to your garden and also a wonderful unique gift.